The Humble Cat is a rather delightful coffee shop and deli on Shelford road just across from the Methodist Church in Radcliffe on Trent. It is the sort of place that I dream of finding when I am out on a food hunt. 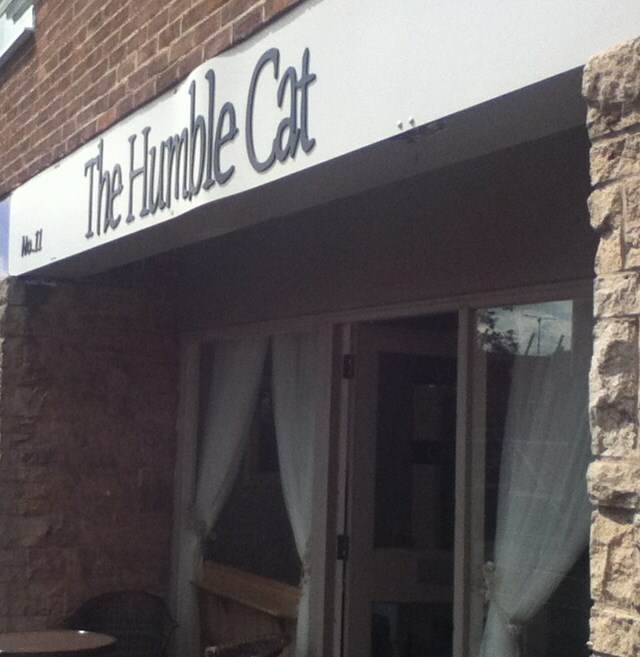 I saw the Humble Cat sign when I was over that way driving from Shelford through Radcliffe on Trent town during lunchtime and I just knew then that we had to become and indeed were going to become very quickly aquainted, I did a quick (legal) U-turn and pulled into one of the roadside parking spots alongside the café door. The Menu board had a lot of really mouthwatering sandwich filling combinations, some real classical flavour matches, and some with a lightly elevated touch. I should really have sat close enough to the chalk board so that I could have taken a picture to show you the full selection. Instead though I ended up furtively typing the combinations that had really caught my eye and that I knew some of my more local dwelling food lovers would be interested in trying. In no particular order I was drawn to record and now relate the chalkboard offerings of “Beef, Stilton, and Red Onion Marmalade” and the “Mozzarella, Pesto, and Sunblush” both for £3.80. A “Brie and Crispy Bacon” offering for £3.40, and also more classically the “Beef and Horseradish” for £2.80 and finally a filling of “Egg Mayo, Leaves, Black Pepper” also for £2.80. On any other day I would quite probably have taken advantage of that last egg mayo themed offering, but not today. 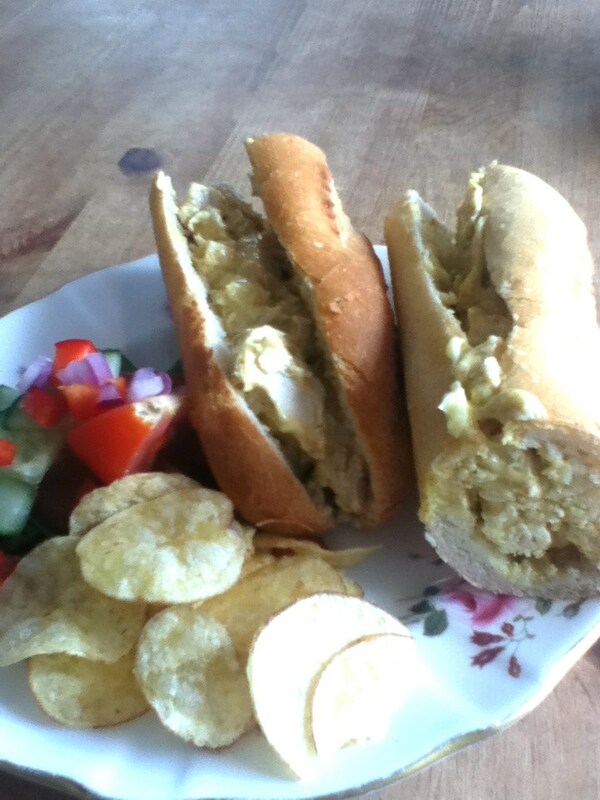 Today I was continuing my recent ongoing love affair with the decidedly decadent Coronation Chicken for just £3.40. 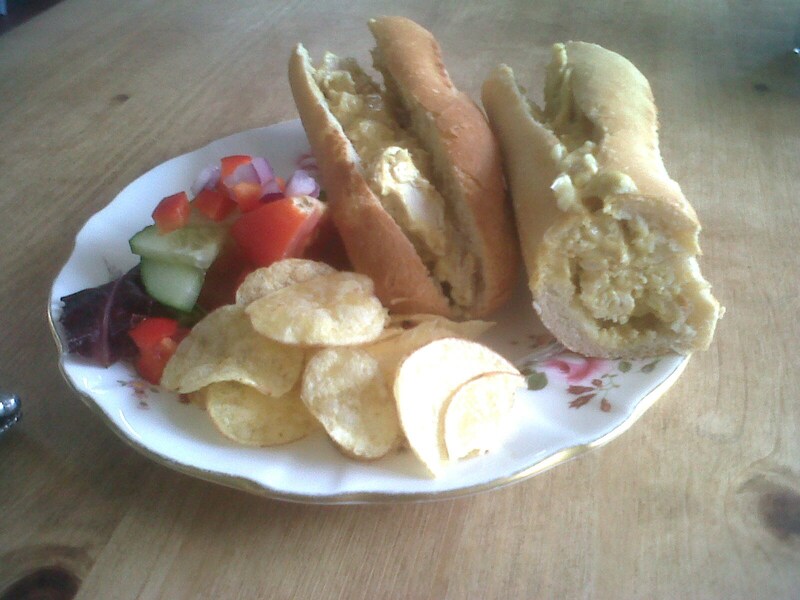 The Coronation Chicken Sandwich turned out to be two fairly large half baguettes filled with creamy yellow Coronation Chicken. There was also a good side salad with three different leaves, some rocket, some watercress, some red lettuce, and crisp leaf. Added to the green leafy stuff the salad also had chopped red pepper, finely sliced red onion, cucumber and tomato. The rest of the plate was covered with a scattering of plain crisps. A pretty well stocked plate at a fair price.I was happy enough with my delightful crusty Coronation Chicken filled roll, the rest of the plate was just an added bonus. 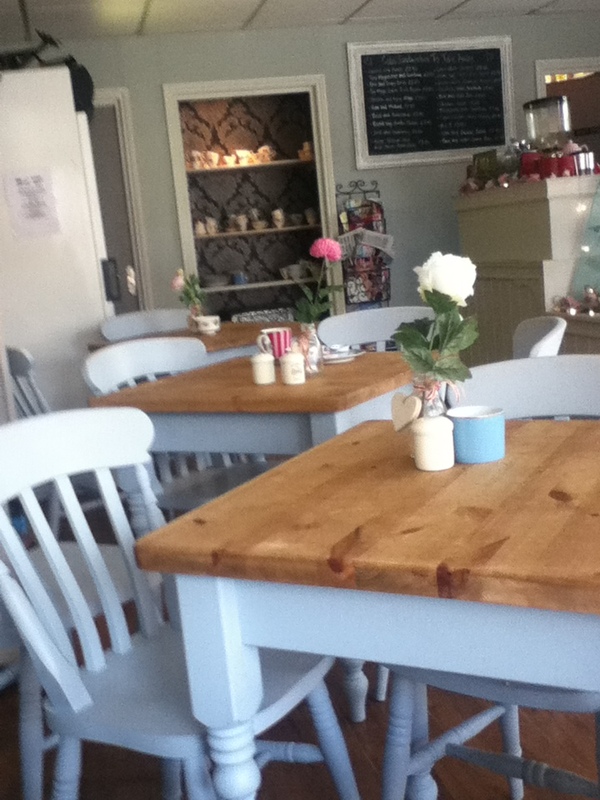 I think I might have fallen in love with yet another local cafe in the area. It warms my heart that such places exist and it gives me hope for the British high street. Next time you reach for that plastic packaged sandwich at the service station or supermarket shelf, don’t, stop and find your own Humble Cat. Trust me there must be one near to you, use it and tell me about it, that is assuming that you find it first and I don’t beat to you it. 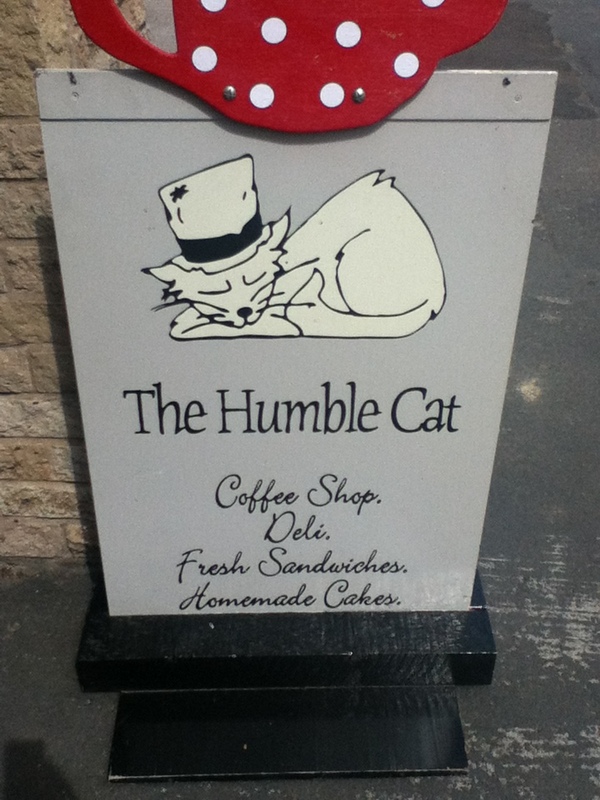 The Humble Cat is located at 11 Shelford Road in Radcliffe on Trent, and is open Mon – Fri: 8:30 am – 5:30 pm, and on the weekends they are open 9:00 am – 4:00 pm (Sat) and 10:00 am – 3:00 pm (Sun). You can contact them and check out what is happening at the Cat on their Facebook page.